He started out as a prospect we really liked when he was offered. Then after seeing him at The Opening, it was clear he deserved to be mentioned with other elite prospects. 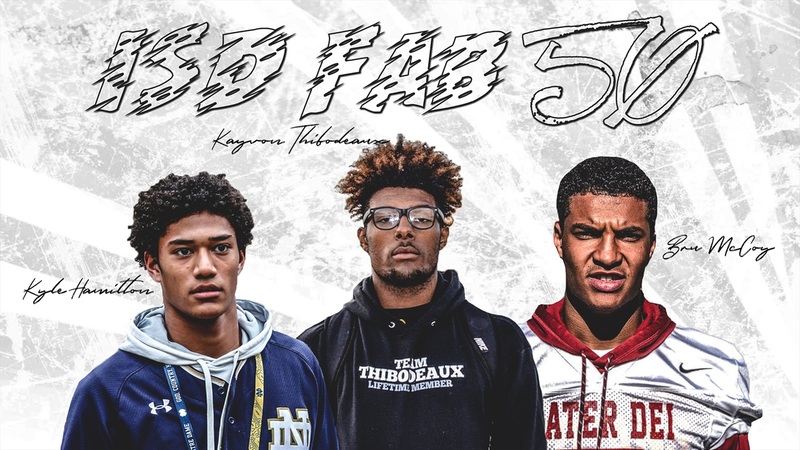 After a fantastic senior season, Notre Dame signee Kyle Hamilton‍ made his way into the final 2019 ISD Fab 50. He’s the only Notre Dame prospect to make the list. The rest of the list is, unsurprisingly, slanted heavily south. 23 of the final 50 are headed to the SEC with four more potentially joining them. The next highest conference total is the Big Ten with seven. Five are going to the Big 12, but four of them are headed to Texas. Four are going to the ACC, but three of those are going to Clemson. Neither of those teams are close to bringing in the type of talent that Alabama is, though. They have nine (and counting). Any notion that the dynasty is over can can be thrown out the window. Nick Saban is reloading and many of the Alabama commits were players who I gave a big bump with my grades after watching dominant senior film. I know that’s not what Notre Dame fans like to read, but it is what it is right now. Alabama is going to bring in the number one class in the country on Wednesday and I don’t think any other program will be close to them in this cycle. - 26 of the 50 had offers from Notre Dame, but I believe only seven visited campus. Aside from Hamilton, there was only one other that the Irish were a legitimate contender to sign and that was linebacker Nick Henrich‍ (46). - In terms of future opponents, three on the list are headed to Georgia and the Irish travel to play them in Athens this fall. Nolan Smith‍ (2) and Nakobe Dean‍ (18) are two defenders that I believe could see the field right away for the Bulldogs. Logan Brown‍ (25) is headed to Wisconsin and Notre Dame has a two-game series with them coming up in 2020 and 2021. With the way they develop offensive linemen, Brown is very likely going to be an elite tackle for the Badgers at that time. 5-star safety Daxton Hill‍ (8) is going to Michigan. He is talented enough to compete for their open free safety job this season and could be playing there when the Irish visit Ann Arbor in October. Three players are going to Clemson and it could be four if running back Jerrion Ealy‍ (20) chooses the Tigers. He also might decide to go pro in baseball so that possibility is out there as well. Regardless of what Ealy decides, they are adding two more explosive wide receivers in Joseph Ngata‍ (12) and Frank Ladson‍ (45). It’s not going to be fun with Trevor Lawrence throwing to these two when they travel to South Bend in 2020. They’ll be bringing a big time corner in this class on that trip as well in Andrew Booth Jr.‍(17). - Now for some good news for everyone who wants to pretend that other stuff is not happening. Oregon and Washington beat USC for some top recruits. There are three on the list that probably would have been Trojans if they were their usual selves. At the moment, they are not and those guys are headed elsewhere. The only USC commit on the list is wide receiver Kyle Ford‍ (31) and he may not sign with them tomorrow. They already lost Bru McCoy‍ (15) to Texas and may lose another stud receiver Puka Nacua‍ (just missed the cut) as he has taken several visits to to other schools. Normally USC closes strong on signing day. If they keep Ford and Nacua, they’ll add to an already great receiving corps. If both choose somewhere else, then the class will end with a fizzle. - Jake Smith‍ (going to Texas) was number 51 and would have made it five UT commits in the Fab 50 if he was in it. Last year UT had six in ISD Fab 50. They are compiling a ton of talent in Austin. - It’s not a strong year for quarterbacks. Auburn commit Bo Nix‍ (26) went wire to wire as my top quarterback in this class and is the only one in the 50. Texas A&M commit Baylor Cupp‍ (49) leaped up as the only tight end to make this list. I had him ranked way lower than he should have been. His senior film is exceptional. - 31 guys who were in my initial Fab 50 for 2019 ended up in the final one.